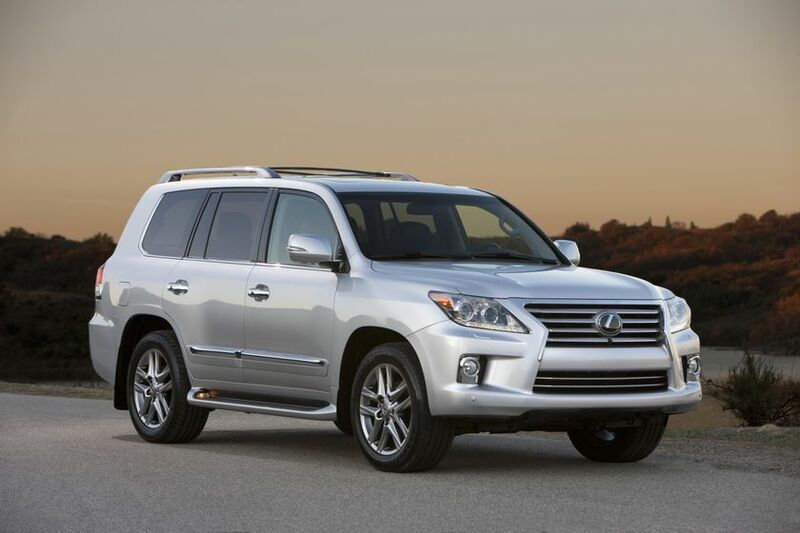 (Toronto) January 19, 2012 – Sporting a new Lexus spindle grille, new 20-inch alloy wheel design and upgraded interior for the 2013 model year, the eight-passenger LX 570 continues to deliver on challenging off-road adventures as well as luxurious daily driving. 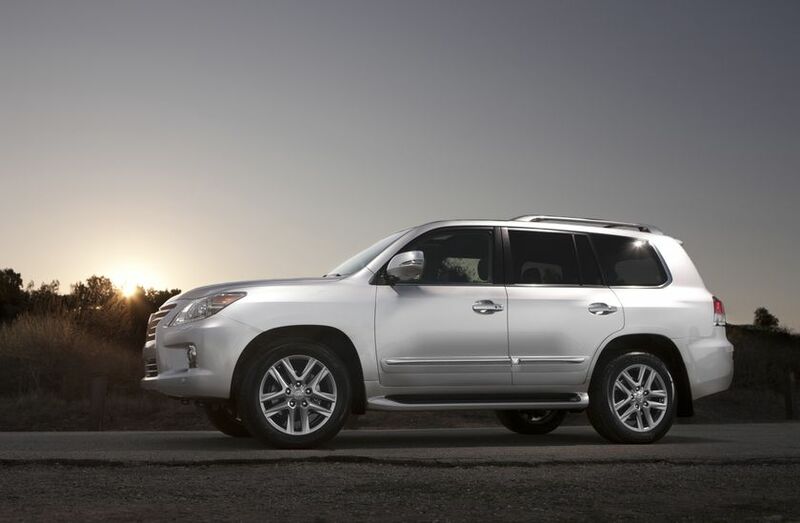 The 2013 LX 570 gets a new look at both the front and rear. New LED daytime running lights complement new headlamp design and new larger fog lamp bezels. Taillamps are also updated, while the rear license plate surround gets a revised look and the tow hitch cover is more integrated. Both front and rear bumpers are refreshed, and the rear bumper protector is enhanced by a chrome accent. Turn signals have been added to the side mirrors, and wider bodyside moldings sport a new look. The spacious, eight-passenger cabin of the LX 570 receives a number of upgrades and changes. The driver’s seat gets a new Easy Access system, which makes entering and exiting the vehicle easier. The steering wheel and driver’s seat automatically retract when the ignition is turned off. Front seats also feature improved cooling, and a 120-volt power outlet has been added to the middle row. The instrument panel has been updated and a new colour display is applied. A dark chrome finish for the centre instrument cluster and front side air vents, along with a new chrome accent above the glove box, freshen the look of the instrument panel as well. The cabin of the 2013 LX 570 also gets mahogany wood trim. Parchment replaces Cashmere as an interior leather trim colour. Two new exterior colours are available: Nebula Grey Pearl and Satin Cashmere Metallic, replacing Twilight Gray Metallic and Golden Almond Metallic. The LX 570’s 5.7-litre V8 delivers the punch and towing power demanded in this segment. The powerplant produces 383 horsepower at 5,600 rpm and peak torque of 403 lb.-ft at 3,600 rpm. Crucial to LX customers who tow with their vehicles, 90 percent of peak torque is available at just 2,200 rpm. The LX 570 is equipped with an electronically-controlled six-speed automatic transmission that estimates road conditions and predicts the driver’s intention in order to select the appropriate gear ratio for the vehicle’s speed and the driving conditions. A sequential shift mode allows the driver to select gears manually. Even at very low speeds, such as trail driving, the transmission operates smoothly and imperceptibly. The LX 570’s transfer case provides full-time four-wheel drive that is equally adept at handling the rigors of slippery winter weather or deep mud or snow. The system uses a TORSEN limited-slip locking centre differential to distribute power 40:60 front-to-rear, directing more power to the wheels with the best grip should slippage occur. Four-wheel Active Traction Control (A-TRAC) employs both brake and throttle intervention to help control wheel spin. Vehicle Stability Control (VSC) helps maintain directional control during cornering and can be disengaged via the “TRAC off” switch. The updated Crawl Control feature provides optimum throttle and brake modulation when maneuvering over rough, uneven or difficult surfaces. The new Off-Road Turn Assist feature also helps by tightening the turning circles by adding more brake force to the inside rear wheel. The new Multi-terrain Select also allow you to optimize performance by choosing from five types of terrain. Hill-start Assist Control (HAC) helps provide additional control for off-road driving by helping to keep the vehicle from rolling back when your foot moves from the brake to the gas pedal on a steep incline or slippery surface. The LX 570’s highly capable chassis is equipped with an advanced suspension system. The high-mount, independent double-wishbone front suspension allows for nine inches of total front wheel travel for outstanding articulation over rough roads and obstacles. The four-link trailing-arm rear suspension retains the solid-axle configuration for strength and durability. Body-on-frame construction provides ruggedness and durability in challenging driving conditions, plus impressive ride isolation characteristics and a 7,000-pound towing capability. The Active Height Control system lowers the chassis by about two inches for easy entry and exit and returns automatically to its normal height when the vehicle begins to accelerate. An Easy Access mode allows the driver to also lower the vehicle when it is parked. For improved aerodynamics, the AHC system lowers the vehicle at highway speeds. When the transfer case is shifted into low range, AHC raises the vehicle to provide additional ride height in driving situations where chassis clearance is at a premium. The Adaptive Variable Suspension system provides three modes to control the spring rate and shock absorber damping force to provide optimal handling and comfort for on-road or trail driving. Comfort mode provides a softer response on extremely bumpy roads, while the Normal and Sport modes help provide increasingly greater levels of control for driving a heavily loaded vehicle, driving at higher speeds on paved roads, or driving on unpaved roads. The standard split five-spoke, 20-inch alloy wheels with Liquid Graphite finish wear 285/50R20 tires. The multi-terrain ABS system determines road-surface conditions and automatically optimizes lock-up control, selecting the suitable ABS profile for on- and off-road driving surfaces. Electronic Brake-force Distribution (EBD) employs the ABS to properly balance braking forces between the front and rear wheels, while Brake Assist (BA) provides auxiliary force to assist the driver during emergency braking. The LX 570 is equipped with 10 standard airbags, including driver- and front-passenger knee airbags, front and second-row seat-mounted side airbags in the outboard seating positions, and roll-sensing side curtain airbags that cover all three rows. All eight seating positions feature three-point seatbelts. The second-row seatbelts integrate pre-tensioners for the outboard seats and an ALR/ELR (Automatic Locking Retractor/Emergency Locking Retractor) seatbelt for the center seat. The LX 570 was the first vehicle in its class to use Active Front Headrests which move upward and forward in the event of certain low speed rear-end collisions when the force of the occupant’s body is applied to the seat back. The LX 570 was also the first in its class to offer available Pre-Collision System with Dynamic Radar Cruise Control. In addition, LX 570 was the first Lexus to offer the optional Wide-view Front and Side Camera feature designed for use in tight settings, such as parking garages. With cameras located within the front grille and under the passenger outside mirror, the driver can check hard-to-view areas by simply pressing a button on the dashboard and viewing the camera images on the standard navigation system screen. The Wide-view Front and Side Camera functions up to a vehicle speed of about 12 kph and can display the front and side views simultaneously in split-screen mode. A full array of standard luxury amenities includes four-zone independent climate control, heated and ventilated front seats and heated second-row seats (outboard position only), a rear back-up camera, Lexus Navigation System, casual-language voice recognition and nine-speaker Lexus Premium Sound system with iPod/USB connectivity, and streaming music and phonebook download via Bluetooth. The standard power-sliding second-row seat slides forward and aft 88.9 mm (3.5 inches) for passenger comfort and cargo storage versatility. The second-row seatbacks provide a convenient 40/20/40 split. The second row seat is specially engineered to make tumbling it forward easy for anyone. A power retractable third-row seat is standard. The split rear tailgate features a power upper door, while the bottom section raises and lowers with minimal effort. The LX 570 offers an optional Ultra Premium Package that includes a cool box for beverages; semi-aniline leather-trimmed upholstery with contrast stitching, heated steering wheel and mahogany wood trimmed door switch plates. The Ultra Premium Package also comes with additional safety features such as the Pre-Collision System and Dynamic Radar Cruise Control. In addition to the Ultra Premium Package, the new LX 570 now features a rear dual screen rear-seat entertainment system with wireless headphones and three-prong electrical outlet. This system allows two video sources to be viewed at the same time – for instance, one can be used as a DVD player while the other as a game console or audio player. For audiophiles, a 19-speaker Mark Levinson Reference Surround Sound audio system is also available with 450-watts maximum power and 15 channels. All new Lexus vehicles come with a 48-month/80,000 kilometre basic limited warranty with roadside assistance for 48 months/unlimited kilometers. Powertrain and restraint system coverage is provided for 72 months/110,000 kilometres. Corrosion perforation protection is covered for 72 months, regardless of kilometers. The 2013 Lexus LX 570 receives $1,310 worth of upgrades, including a 9-speaker premium sound system, off-road turn assist, multi-terrain traction control as standard -even as Lexus drops the MSRP by $ 2,950 to $87,000. 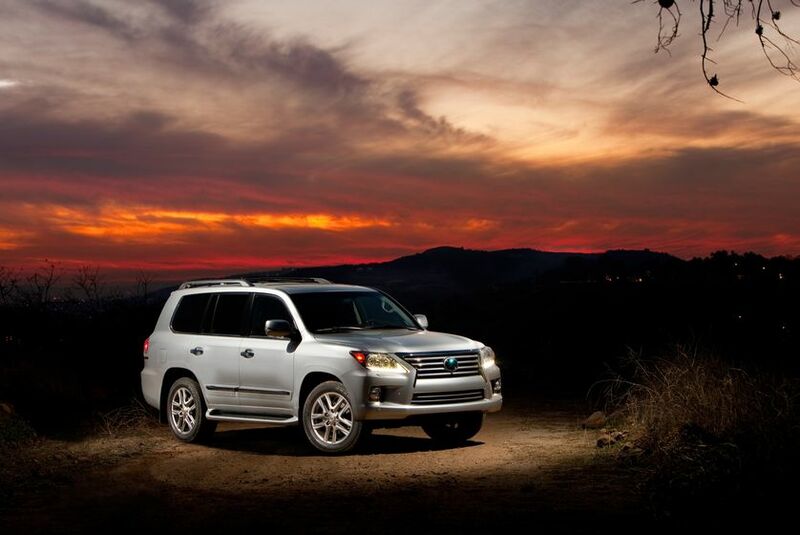 The MSRP for the 2013 LX 570 with Ultra Premium Package starts at $94,350, which is $6,450 less than the 2011 model. The 2013 LX 570 will be on sale in Canadian dealerships in February. Lexus in Canada is the exclusive Canadian distributor of Lexus luxury cars and sport utility vehicles through a sales and service network of 35 dealers across Canada. With 5 models on the road today, Lexus has the largest luxury hybrid lineup; allowing guests a choice in a large range of luxury vehicle segments. In the 2011 J.D. Power and Associates Initial Quality Study (IQS), Lexus won the most segment awards, four in total, of any nameplate. For more information about Lexus products, and Lexus’ pursuit of perfection, visit www.media.lexus.ca.